This blog post is based on a presentation given by coordinator Lisa Matthews, at the launch of Dr Victoria Canning’s new report on “asylum harms”, at Bristol University on 21 March. That’s where our Toolkit came from – nearly ten years ago now, the organisation met with community groups around the UK and found out what they needed most from us. In the context of devastating legal aid cuts (with much worse to come), they said they needed a way to let people know what was coming in the legal process, that it was likely to involve refusals, detention, destitution … and how to get people to prepare for that rather than running a mile. 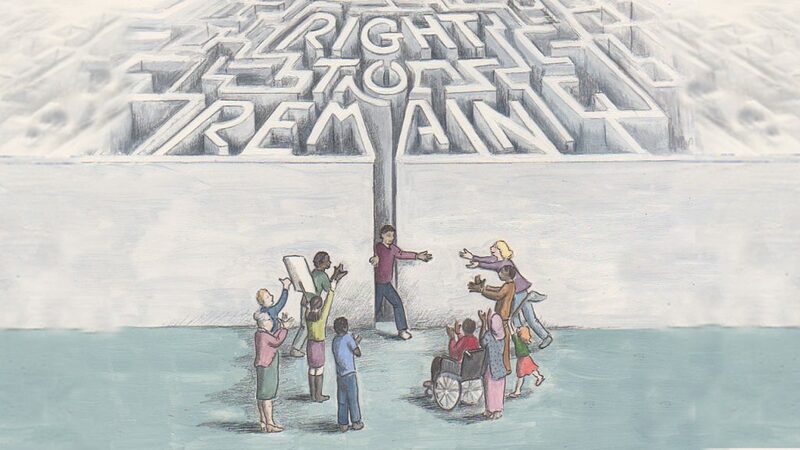 We developed the Toolkit – a book and online resource that helps people to navigate the asylum and immigration system, and a programme of training in the community around the Toolkit, which shares the information we have and gleans information from communities about their own expertise and problem-solving. The resource took off in a way we really hadn’t anticipated – partly, sadly, because of the enormity of need with people getting very little legal representation and crucially often not knowing (if they had a lawyer) if they were doing a good job. Now, over 10,000 people access the web resource every month and the book is used in community groups across the UK. Last year, with Dr Victoria Canning and Calverts press, we developed our asylum navigation board. This came from wanting to encourage people to adopt the approach that we had seen to be so powerful and effective – of people coming together, sharing knowledge, realising that they’re not alone, that it’s the system that’s failed and not them, and vitally – that there are things people can do to be in a better situation. What do we mean by self-help, solidarity and mutual aid? We’ve recently been asking the people we work with to explain what they think the word “solidarity” means, and it’s been enlightening and beautiful. Have a look what people have said here. When we talk about these words – self-help, solidarity, mutual aid – we talk about how self-help might sound like doing it on your own, helping yourself. In it way, it does mean helping yourself, instead of leaving it someone else, like a lawyer. But it doesn’t mean doing it on your own. We mean the opposite. People, together, helping themselves. When we talk about mutual aid, we talk about sharing the work, the results, the benefits. We help each other. And by giving help to benefit someone else, it can also benefit you. By working together, we can all become stronger, more able to deal with the hardships of life, the hardships of the immigration system. And one definition I loved, from someone who is seeking asylum, is that solidarity is doing something not so you gain something for yourself, but so that change can happen. These terms can seem quite abstract, but our work is based on the very practical applications of them in people’s every day lives – people taking practical action, for themselves, for others. It means people understanding the process they are going through a bit better, being prepared for bad things that might happen, having a safe space to think and talk through what they want to do, taking action to progress your legal case. going along to an appeal hearing, to be a friendly face for someone who has their appeal. Appeal hearings are open to the public unless an anonymity directive is in place, meaning the hearing will be held in private because of the particularly sensitive nature of the case. This doesn’t happen as often as you might think, and the judge gets to make the decision on this. signing support – systems for people who have to regularly report to the Home Office, for taking action if someone is detained at one of these routine appointments, and there’s a great, quite formalised version of that here in Bristol, with similar processes in Glasgow, Leeds and Sheffield among other places. more practical things, like community childcare if someone has an appeal hearing … and responding to such basic needs, like food parcels and sanitary items for people who are destitute, hosting people who are homeless. anti-raids actions – alerting people to immigration raids happening, notifying people subject to the raids of their legal rights, filming what is happening. We find that a huge variety of people get involved in these actions. Sometimes it’s people seeking asylum and other undocumented folk helping each other out – there can be long periods where not much is happening in your case and some amazing people use that time to help others out .. if a lot is happening, or for example if you’ve just had a refusal in your own case, this is not so easy. And sometimes it’s local people who have more secure immigration status, or British citizens, who may be best placed to do some of the actions such as signing support and detention visiting (because they are not at risk of detention themselves). It’s the coming together of these different people that is so inspiring. People, friends sometimes ask (including people who are going through the asylum and immigration system themselves), “How can you do your job, it must be so depressing?!”. Well my answer is always this – it’s the examples of people, of actions, of groups, communities helping each other out in great adversity, it really does give you hope. I see these actions as resistance – as refusing to be silenced and disempowered by a brutal and baffling legal process that is designed to refuse, designed to deny. We need practical actions that make a difference to a person that day, we need bolder acts that disrupt the operating of the system that harms so many; and we also need to argue for a different way, a different society, a different world in which we recognise that Migration is Life. A world in which the policies that necessitate the actions I’ve described have no place.